The gangrene statement is downright appalling. I can’t believe anyone would make such an ignorant statement, let alone a person seeking to represent our community as a School Board member. Also, the test-scores statement was incorrect. The single-digit numbers were not our students’ test scores. The single-digit number was a combination score given by the state after it calculated our growth, proficiency and achievement-gap reduction (between subgroups) as related to our performance on the Minnesota Comprehensive Assessments. While that score is not where we want to be, the fact remains Welty either twisted the facts or he does not understand Minnesota Department of Education’s process of reporting school progress. It is not in anyone’s best interest to have a representative who is divisive and uninformed. First let me acknowledge that the letter writer is correct. The single digits I have referred to are not exactly test scores. They are the state’s appraisal of where we rank, or in her case, where Stowe school ranks among all schools. Like previous bureaucratic state crusades [eg.the nearly incomprehensible OBE (Outcome Based Education) that nearly pushed my son to get a GED] the new testing required by Minnesota requires crystal balls and a Doctorate in Education to understand. Still, for those poor souls who have neither of these to guide them what they see is a single digit ranking. I know that Stowe classes are godawful crowded. One parent introduced me to her first or third grade daughter and told me there were 33 students in her Stowe Classroom. This is why parents are abandoning the Duluth Schools and that abandonment, not the teaching that Stowe teachers are attempting to offer in their overcrowded classrooms is the gangrene I refer to. As I knocked on a door opposite Stowe I turned around to see a high school kid coming home wearing his Proctor Rails Jersey. “I just go to school where my friends do,” he told me when I said I was hoping to get him back to the ISD 709 schools. This teacher is a great advocate of her school. We need that fierce pride and I do not mind that its fury was directed at me. It would, however, be put at better use by focusing on Johnson Controls. It would, however, be better focused on what Johnson Controls wrought. For their $85 million in earnings they drove 1,700 students away from ISD 709 schools. They got 180 teacher laid off. They oversaw a constant shuffling of students and faculty in their mad rush to get all 15 of their jobs done lickety split. These actions left this teacher’s class grossly overcrowded. One East student who’s bullying was probably overlooked by frantic staff during those mad days committed suicide in September. That bit of gangrene was in eastern Duluth not Western Duluth. I learned some powerful vocabulary words from Mrs. Jones in my seventh grade English class. Among the vocabulary words I recall are Weimaraner, deshabille, cadaverous. I learned gangrene elsewhere but I learned from Mrs. Jones the importance of using vocabulary that clearly expressed my thoughts. So, just in case there are any doubts about what I mean by gangrene spreading through Western Duluth, this is its origin. A greedy, duplicitous, litigious Fortune 100 company ( 67 on Fortune Magazines top 100 ranking) with more employees than Duluth has Citizens reaped an unconscionable reward while impoverishing the school system I’ve been powerless to protect for the past six years. Gangrene can be reversed like all infections. Art Johnston hopes to get some of this excessive payment back into the Duluth School budget. I do too. For Stowe School. As time has gone on it has become increasingly silly to think JCI would earn so little from the grandiose Red Plan. Furthermore even though they have been largely ignored the few Let Duluth Vote representatives on the Duluth School Board have been able to keep track of the data that ISD 709 has to make public and report to the state of Minnesota. Among these are the payments to Johnson Controls for work on the Red Plan. To that end Duluth can be grateful that the current sole survivor of Let Duluth Vote is the sometimes quarrelsome Art Johnston. It is no wonder that Art is irritable. Like other Red Plan critics he has been starved for public data but has managed to put it together long after the Red Plan facts have dribbled out. It is particularly valuable because like Robert Aho before him Art has been a contract administrator for the Federal Government. Art explains that any deviation of the Federal contracts he administers would have gotten him fired. So when the Red Plan offered Johnson Controls between 14% and 18% percent in earnings of the project he kept an eye on how those soft costs accumulated. This pdf shows that JCI did much better than 14% or 18%. Their softcost earnings have been 27% of the entire project costs to date. That means that JCI earned nearly one/third of the total costs expended on the Red Plan. On this page of my campaign website you get a little further explanation and a link to this pdf of Art’s analysis. …I’m not supposed to talk about. Because I signed an agreement to keep the public ignorant so that the donors of a $100,000 bond to stop the Red Plan could get their money back. JCI’s no bid contract was also a no scrutiny contract. The Duluth School Board authorized it with a vote without ever looking at the contract. It wasn’t even signed by chairman Ann Wasson until a long time afterwards so indifferent to law and protocol was the Dixon Administration. Then again, the same School Board forwarded on to the Minnesota Dept. of Education the Red Plan’s extensive Review and Comment, which guaranteed classroom money to pay off the building bonds, without ever looking at that either. But the contract could not be hidden for ever. Even before he analyzed the Contract Architect and Contract Administrator Robert Aho wrote about the Conflict of Interest JCI had in administering its own work in the April 2008 Hillsider. Later when Mr. Aho got hold of the contract he made the startling claim that JCI could get up to $92 million of the total Red Plan contract. That’s not far off what they seem to have taken in, $85 million. Gangrene Pt 1 – Where did all the money go? JCI’s offices in Old Central – The tail wagging the dog. Art Johnston told me recently that my characterization that gangrene is spreading from western Duluth to Easter Duluth is going to result in some blow-back for my campaign. I understand but I am unrepentant. The 600 and more doors I knocked on from West End to Fon du Lac tell me our western schools are on the verge of becoming places families avoid. Its not happened yet. It should be possible to reverse. But shooting the messenger will not fix them. That gangrene began when the School District and JCI began the practice of lying and covering up. In this they had many allies not the least of them a retired State Senator and former Ohio Community College President Ralph Doty. This is from Ralph’s column which showed up three days before an election which cost me but, fortunately, not Garry Glass election to the Duluth School Board. Ralph Doty’s ringing defense of Johnson Controls and his unhinged attack on its critics. This is the entire June 19th article that Ralph Doty refers to in the Duluth News Tribune which I found with the help of the Duluth Public Library’s Online Newsbank. JCI’s assurance that they will only collect $4.5 million is in the first two paragraphs of the five telling paragraphs I’ve included. You will note that JCI’s representatives say they will only be paid $4.5 million. You may also recall that I maintained in an earlier post that they received almost $85 million. Someone has not been honest. The firm entered into a contract with the district for designing and implementing a long-range facilities plan after a public bidding process held in January 2006. I saw the first of these lawnsigns a few days ago and could barely read it as I zipped by at 25 mph. I got the first line and attached this post’s title to the message right away. Screwing kids is, of course, not what the lawnsign is meant to get across. But that’s what will happen if voters heed the message. We’ve got 40 kids in classes today. If the first question levy fails we will have to cut 2% of the District’s current budget. On its face that could be 40 teachers. Here’s how I got that number. Divide the average teacher’s salary (as outlined by recently retired DFT President Frank Wanner) of $61,000 into 2.5 million dollars (2 percent) and you get 40.98 teachers. This is probably too simple but there is not a lot less we can cut besides labor which constitutes 80% of our operational costs. Whatever it is we cut 2.5 million is equal to 40 teachers. So I interpret the sign to mean Save kids, Starve schools. It could just as easily be Save Kids, Layoff Teachers. I don’t think I’m far from wrong. I’m almost sorry to admit this but I have it on the best of authority that the “cockroach” who is attempting to defame me with guilt by association is not the colosus JCI which I rather hoped it would turn out to be but instead a mere gnat. I don’t know who the gnat is and will not speculate further about the tiny winged creature. Even so, I still suspect JCI has been behind earlier attempts to defame me so I’ll keep the Cockroach thread alive even as I alter it to address this recent revelation. I just popped over the the local post office to check to see if there were any new contributions there. Golly there was one and from a fellow I had once heard being told by another that I was an idiot. Much gratified I walked out only to meet my next door neighbor heading into the post office. Judy is moving out at the end of the week so, of course, I wanted to tell her we would miss her. She said that she had done her best to help my reputation in town when she met new people and told them where she live and by whom. She told me she set many of them straight on the relatively good-hearted neighbor she lived next to. She added that many thanked her for giving them a “new perspective” on me. I chortled and replied that I was grateful she’d tried to persuade folks that I was not quite as hideous a person as some make me out to be. I know, of course, why folks would think me to be so evil. Why I tried to deny our children the beautiful new schools they deserved. Yes, that’s one way to look at it. I must hate children. That’s the only rational explanation for my actions over the last six years. You might be surprised to know that this is not how I look at it. Denied honest information I had to guess as to what the Dixon Administration was doing. It didn’t look good to me and I complained. As the recent posts indicate the wonderful caring corporation that supervised the State’s biggest ever school building project for the Dixon Administration was only to be paid $4.9 million for it – according to Dixon. When I find time I’ll elaborate further. In the meantime I’ll reiterate what Art Johnston’s dogged pursuit of honest information has revealed. JCI was not paid a paltry $4.9 million for their work. They were paid $85 million for it. That’s not quite twenty times as much as the Dixonites claimed at the beginning. As far as I’m concerned that is a theft of $80 million dollars from our children. Worse yet, it has crammed our children in classes so horiffically overcrowded that they can not possibly be expected to learn at anywhere near their potential. I must be an angry and unpleasant man……where Johnson Controls and its cockroaches are concerned. But where children are concerned? Please! Give me some credit. …in the preceding post. I’m sure you will want to read all 1,501 of that post’s less than magical words to make sense of them. This is Twice what the contract authorized Johnson Controls to collect. This is close to three times what Gary Glass estimated they would be paid when Ralph Doty called him a liar. This is close to 17 times as much as our administration was prepared to admit that Johnson Controls would be paid in 2006 when the whole Red Plan project was undertaken. It’s a cool but sunny day with Nine days till the election. Oh, what to do? Its dry so it’s tempting to rake the leaves in my yard and begin getting ready for Winter. But, Claudia and I both donated a pint of blood today during Church and as always, we’ve been warned not to do anything too physical. Our church is hosting one of those “trunk or treats” this afternoon for which we will have to start decorating our car in the church parking lot at about 3:30PM. It’s already nearly 2PM. We both took a nap after lunch, Claudia because she was up early to bake a breakfast for Church and me because I’m torn between attempting to do about fifteen things I don’t have time to get done before the election. But, since the cockroach seems to have failed to pull off a Dotycide on me I think the results of the election probably won’t be nudged along much if I finally put lawnsigns up along Woodland Avenue or replace some of the fallen signs elsewhere in Duluth. I really think my best bet is to use the dwindling campaign days while the public is focused on school issues to write in my blog and give people the best information I have while they are still paying attention. Yesterday 960 visitors came to the blog. I hoped they would also take my hint to look at my separate campaign website to read the critique of the District’s finances. It took me hours to transfer it from paper to a Microsoft word 7 document and figure out how to place it on the website with my comments attached. All that work and only 23 visitors showed up to read it. Maybe that serves my purposes better. I can still make the claim to be honest by showing something that undermines my argument to pass levies but know that hardly anyone will take the trouble to actually read the criticism of the Duluth School’s finances. To that end there is an even more troubling indictment of the District and current school board by former School Board member Rich Paulson in the Tribune today. Rich deals with something different than the piece I spent so much time putting on my campaign website. Rich talks about the utter secrecy of the District in negotiating the last two teacher’s contracts. He points out generous health benefits and their financial implications. He points out how the details of both these public documents were kept out of sight by the Dixon administration for in the first case one year after they were approved by the School Board and in the next case by almost two years. I don’t in the least blame Mr. Paulson for the votes he will cast in opposition to the levies in nine days. I will, as I have said many times, be voting for them. I would do this even if I didn’t expect to get elected to the School Board. If Art Johnston or I am not on the Board I see no one who would ask the kind of questions that ought to be answered. Ought to be. I’m going to spend the rest of the day with my grandsons (I guess I’ve just decided what to do today) so the fifteen campaign related things I took a nap to stop thinking about……well, I’ll just think about them later. But before I go I’ll leave you with the mystery I’m trying slowly to unravel in the Cockroach series of posts which I will pick up again eventually. Where did the money go? But the School District’s facilities man quickly explained to Gary Glass, one of my fellow candidates for the School Board, that JCI would get closer to 14% of the total cost of the Red Plan. That amounted to about $33 million dollars (again if memory serves). This, would actually be a pretty typical charge to expect for a project manager to oversee a quarter million school project. Nonetheless, having Gary Glass expose this news after having said they would only get 5 million caused heart attacks. Why if Gary was right the Administration must have either been clueless or lied. To cover this up, Ralph Doty, a former state senator, community college President and new Fargo Forum columnist called Gary a liar three days before the 2006 election. Doty called me even worse things. Gary survived to spend the next four years being denied public information while a Board member (not unlike the complaints of Rich Paulson) but I succumbed to Doty’s criticisms and lost that election. So, the money. The money. What about it? Well, we’ve gone from $4.9 million to 33 million but that’s just the beginning. Now that the Red Plan is all but finished a new Let Duluth Vote School Board member, Art Johnston has been able to compile the list of expenditures, not as they were estimated six years ago, but as they actually have been recorded in the public record. 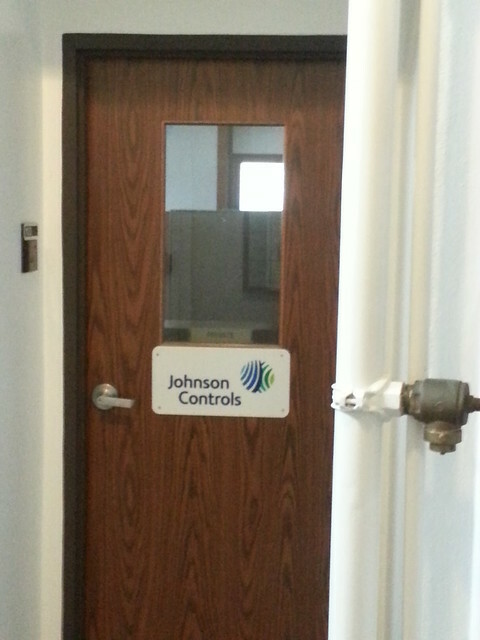 Johnson Controls can claim about 43 million dollars for the work their contract with the District entitled them too. That’s a ten-million-dollar improvement over Gary’s estimates six years ago which caused him so much grief from Ralph Doty. The remarkable information Art has shared with me is that Johnson Controls actually collected, not just $43 million dollars but almost $85 million dollars for its work. No wonder some cockroach would rather have the public talking about my association with a less than stellar person than where the money for the Red Plan went. I linked to this page in the previous post but it deserves mention in its own post. I apologize for the odd way I had to format this analysis. It took a couple hours to do and I’m not very satisfied with the way it looks or is laid out. I offer my insights and disagreements to this analysis in the left hand column. Each point and my rebuttal are put in the same color background. I think much of what the Analysis says is quite correct. I simply differ with its thesis that we don’t need to pass the levies. I offer it for your consideration under the umbrella of my campaign slogan. Honesty is the best policy. This is it. The new “Coackroach” thread is foremost on my mind at the moment but there are other bees buzzing about which I simply must address today. I haven’t even finished the preceding Cockroach 4 post and I’m stopping now to attend to some other items before proceeding. This is a continuing difficulty for the larger threads I have undertaken. Some of them, like the “Sell Central Now” thread of a week or two ago, I’ve never really finished. Art handed over an interesting, and to my eyes credible, analysis of the Duluth School District’s finances vis a vis the two levies. It could easily be construed to contradict my dire warnings. Since I am flagellating myself with my supposed honesty I feel compelled to share it with readers of this blog. I’ll do so by putting it on my campaign website today with my comments to counterbalance its thesis that the levies are not that critical for the School District’s continued operation. It does not change my mind about the spread of “gangrene” from the Western part of Duluth’s School District to the East which my DNT commentary spelled out. Hiring new teachers is the only antiseptic to that gangrene and that means new money from the levies. To that end I do not intend to let the new teacher’s contract give more to the teachers than the current contract. However, should I be elected I’ll only be one vote on a seven member board. I can not guarantee what the majority of board members will do when offered a settlement by the teachers. I can reasonably expect to cast a vote on the new contract because, as the document Art handed me points out, they will want to see how much money is given to the District by voters in the November 5th levy vote. I do not think that November and December will be a long enough period of time to come to a settlement before new school board members are seated in January. If, however, that should happen I’ll feel absolutely free to criticize a poor settlement for the next two years and the people on the Board and in the Administration who settled it before I could be seated. One thing should be made very clear. I do not think ISD 709 teachers have the stomach to strike at this time and have the utmost desire for my stated goals to succeed, to wit: hiring more teachers. They will want my goals to succeed in order to relieve them of the stress from overcrowded Red Plan classrooms that are shortening their lives. If the teachers, especially the newer teachers, are not rooting for my victory they are either ignorant or foolish or deluded. After the levy vote, and after the seating of a new school board and after the settling of the teacher’s contract it may well be time to wrest back some of the mysterious $40 million from Johnson Controls to benefit the badly disadvantaged Duluth School District. That story will continue with Cockroaches 5 after I attend to the analysis Art handed me. Let me make this clear. Art would not tell me who authored the document but I believe he vouches for its contents and analysis. I think I can vouch for its general accuracy as well even though I remain a strong advocate for both levies. If anyone disagrees with this analysis they are free to submit their critique of it and I will publish their rebuttal. That rarely happens but it might be to take advantage of my offer. With less than two weeks to the election suddenly there are thousands of people reading my blog. 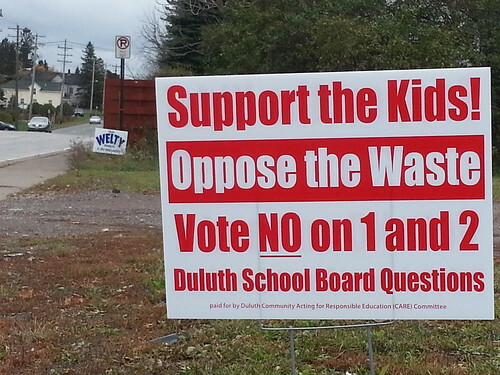 They compose the audience in Duluth that is most concerned about public education. Surely, if I’m misinforming them about what is going on in the District some spokesman will want to address the fallacies that Art, his secret analyst and I are disseminating. In my next post I’ll link to the document and my analysis of it. In the last post I suggested that Johnson Controls might have the motivation, precedent and money to smear me. I showed just how casually this Fortune 500 behemoth can drop a couple hundred grand to get the notice and gratitude of politicians. The one thing that makes me doubt that JCI is behind this little smear, however is its shear penny ante-ness. Trying to destroy me by mere guilt by association is a bit of a stretch. On the other hand it involves a possible association that for most folks would dredge up the “ick” factor. Maybe it could work. It may have worked once before when the blowhard Ralph Doty raked my reputation over his coals three days before the 2006 school board election. All he had to do with his hatchet piece was change the minds of 300 Welty voters to the other candidate and I ended up being toast. Come to think of it one of his primary arguments against me was that the Johnson Controls were reputable folks. A few days ago, I called the Ohio community college where I served as president for 13 years, and confirmed that Johnson Controls is currently working on a large project on my former campus. A long-time employee at the college told me, “The college chose Johnson Controls because of its reputation, as well as the fact that they are under an Inter-University Contract (IUC) with the State of Ohio.” The IUC designation makes Johnson Controls an approved vendor in the state’s higher education system, without requiring colleges and universities to go to bids. After my defeat by a Pro Red Planner the Red Plan only faced one more very worrisome obstacle in its juggernaut to completion. The next obstacle for JCI was the Court Case brought against them and the School Board by me and four other complainants. We charged that they had gotten an illegal “no bid” contract. It was certainly no bid but the case fell apart before we could establish the question of legality. Its still up in the air and I’m not supposed to talk about it. Of course, that hasn’t stopped me before and it won’t stop me now. What did JCI get for its participation in the Red Plan? Good question Harry, I’m glad you plan to answer that. That’s where the $40 million figure I mentioned in part one comes in. Ah its certainly enough to motivate more scandal mongering. But its a big question that I’ll address some posts hence. Just remember. Its a lot of money to fight for. IM GOING TO LUNCH. I’LL EDIT THIS LATER. Cockroaches Pt 3 – Who are the cockroaches? I don’t know. I’m a mouthy guy…….or a fingery guy (since my mouth wags my fingers as I’m typing these posts). I have lots of opinions and they spill out all over this blog. They’ve been spilling out here and in my old website www.snowbizz.com for almost fourteen years since I was first on the School Board. I was in a hurry back in 1999 to start explaining myself when I was up for reelection and one of my fellow school board members began feeding mean spirited things about me and my buddy, Mary Cameron, to allies who then badmouthed us in letters-to-the-editor. Since then I’ve made lots of people mad and any one of them could be carrying a grudge to this day. Frankly, I’m not mad at most people who might want to take a little piece out of me. I might describe them as “cockroaches” here but for these run of the mill kind of critics that’s excessive. And as I wrote earlier I am not at all bothered to have my ideas, votes or political views scrutinized, dissected and parsed. Character Assassination, however, is a little harder for me to swallow. But maybe its not just another citizen like me who is behind the attempt to smear me. Maybe its something bigger. I’d certainly like to think it was. That would satisfy my hunger to fight off a colossus rather than a gnat. I do have one colossus in mind. I also have a motivation in mind that might drive them to impugn me. I even have some precedent to build upon for my suspicion. I certainly know they have the money if they would like to defang me. I got a reminder of that when I checked out my old October 2007 blog posts. I’d forgotten about this one. I’ve mentioned that after the forum at Meyers Wilkins Elementary I rushed home to write an ad which would address a scandal which I’m still waiting to have unleashed against me. I think the cockroaches may have scurried back under their rocks since I first addressed it but I don’t know that for sure. I waited up to see if the Television station in question was going to make an issue of my “honesty is the best polity” slogan before beginning to write. They didn’t. That gave me 90 minutes to write my ad. For those who have read my intermnible blog posts you already know I’m not a big fan of sound bites. My ad wasn’t going to be a bite. Rather it would take a bite out of the cockroaches. Protein is good for a politician. I got it in just before the Midnight deadline. That’s pretty fast writing for anyone and in my case I always worry whether what made so much sense the night before will hold up well in the morning light. I just picked up my Reader and checked it out. I think I got my point across pretty well. I did, however, note one letter missing. I began one sentence, “Judging by the crowded lasses in Duluth….” I’m hoping that Readers will figure out I’m referring to classrooms not women. Oh, golly. There were even more visitors to this blog yesterday than the day before. I hope they keep showing up because I’m on to something a lot bigger than my reported association with a person of questionable character. It’s such a big story that it will probably take me several days to write it out so that I am not at risk of being sued for slander. I just love skating on thin ice even if Claudia worries that I could cost her the pension plan she has earned. I can’t help but wonder if the nothing burger scandal some anonymous sources are trying to manufacture about me might not be connected to this much bigger story. As per usual I will take my own sweet discursive time outlining the story. I’ve got to keep my readers on the edge of their seats so that they keep coming back for a punch line. This one may be worth $40 million to someone. I’ll attempt to put this ad in the Trib next week once or twice. Any help with a donation will be much appreciated. I’m also putting an ad in the Reader Weekly this week explaining more about the bogus scandal some detractor of mine is attempting to gin up. Twenty twentyfive dollar donations would go a long way to paying for this. Rescuing the Duluth Schools and our children from its own mistakes is proving to be both expensive and potentially lethal to a would-be Mr. Smith’s reputation. If you’ve never seen the Frank Capra movie Mr. Smith Goes to Washington sit back and prepare to renew your faith in Democracy!